ASVA’s (the Association of Scottish Visitor Attractions) ‘Rising Star of Tourism Award’ was presented to Sarah Hammond, MUSA’s Operations Officer, at its annual conference on 17/18th November for her commitment to customer service. 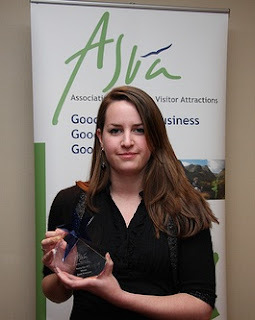 In August 2011, VisitScotland awarded the museum 5 stars under the VAQA scheme and mentioned that the welcome and information received from staff was instrumental in the museum gaining this high accolade. MUSA's visitor numbers in 2011 surpasses all previous records; its success shows that a university museum can cater both for its own staff and students (for recreation and academic purposes) and the general public.